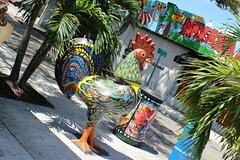 An incredible day out in Miami's legendary Little Havana, worthy of the luxury title. Your group size is limited to just 6 guests and features a number of hosts and a knowledgeable, photographer guide. You'll have fantastic fun in a relaxed, exclusive atmosphere, getting to know the people and places in a manner not available through any other tour. Learn a new style of painting with a renown Cuban artist, get hands-on and behind the scenes at one of the only remaining Cuban cigar factories, master the mojito at Frank Sinatra's hotel bar, and much more. This experience includes a great selection of food and drink to enhance the unique activities at each stop. You'll make and enjoy or even take home some great souvenirs from the experience, and you'll also have complimentary access to a gallery of downloadable imagery when you return home! Meet at the home gallery of renown Cuban artist Agustin Gainza, where the painter and his wife will entertain you with a personal account of personal and Cuban artist history relevant to the region. They will close the business for your painting session as you try your hand at the Gouache style and sip hand-crafted Cuban style sangria. You'll then enjoy some time to socialize or take photos and enjoy home-cooked snacks while your masterpiece dries. You'll receive a signed, limited print series gift to take home! Your guide will share some local history and point out highlights as you walk briefly to the next stop, one of the last hand-rolled cigar factories in the district. Retire to the exclusive VIP room and enjoy the current curation of art before you are served gourmet Cuban coffee and accompanying snacks. Engage in a presentation outlining some of the processes which make Cuban cigars so special before heading behind the scenes to learn about the practicalities of the modern process. You'll then have exclusive access to the commercial humidor and even learn an incredible history of the owner's personal collection and how it came to be. You'll then get a chance to experience the hand-rolling techniques mastered by craftsmen and women who've been practicing their brand for many years, sometimes decades, another tour exclusive. Afterward, try an instructed brandy or coffee pairing and receive a gift from the owner. Another brief walk to your final stop for the day, an art gallery and museum that features perhaps the country's largest selection of individual rums, again with informative and entertaining chat from your guide. You'll be welcomed to a reserved space at the very bar Frank Sinatra favored at his Havana hotel where you'll get a private mixology lesson in the art of the Cuban mojito and learn the incredible story of how the museum came to be. Drink in hand, explore the museum's works with direction from your hosts before your final highlight, an interactive rum tasting with a selection of snacks chosen specifically to tease out flavors and enhance the overall enjoyment of the rums you'll be trying. Sadly, this is where your guided experience comes to an end and the tour comes to a close. However, you'll be welcome to stay and enjoy a 2-for-1 priced drink and any entertainment put on by the establishment. Remember, you'll also get access to a complimentary gallery of images when you return home!